Educated at the University of Art and Design Helsinki. 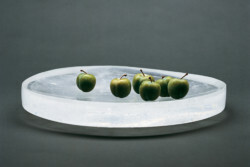 Projects include glass pieces designed for John Pawson Architects and When Objects Work. Has exhibited at the Frieze Art Fair and has works at the Foundation, Louis Vuitton and the Indianapolis Museum of Art. Currently works with the TukTuk, using real and paper flowers. Lives in Oxfordshire.